The All-In-One solution for the craftsman of today! 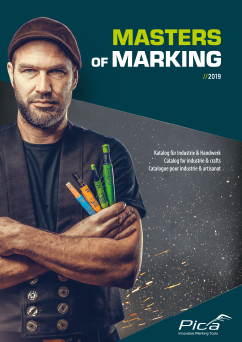 The 3 useful marking kits offer the user a selection of premium marking solutions, specifically tailored to his occupational area. Packed in a robust & compact nylon wallet with failover for refill sets, the contents are perfectly protected. The high quality velcro fastener guarantees fast handling. Thanks to its high quality, the wallet is used for a permanent storage – no more searching for lost markers! With products like Pica-Ink Deep-Hole-Marker, Pica-Dry Longlife Automatic Pen, as well as Pica-Gel Signalmarker, Pica-Marker has modernized the marking industry and craft. Technical competence and expert experience collected during decades in the writing instruments industry, and the inventive genius of the company’s founder Gerhard Möck constantly make visions come true, to bring extremely expedient and practical product details into the craftsmen’s workday life. Best examples are: Pica-Ink’s “adjustable telescopic nib”, which enables a considerably longer product life or Pica-Dry’s integrated sharpener in the quiver cap. All these details have already defined new standards and facilitate work in the construction industry, in workshops, or in factories.